This is a 22 inch high three-dimensional life size bust in a high fired bisque. Hand painted bronze patina. 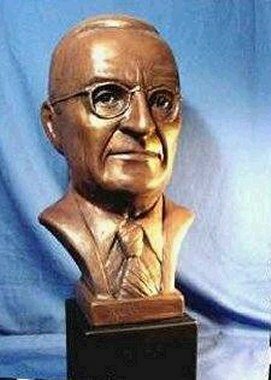 The Truman Bust is also available in a limited  edition bronze. Contact Robert Toth for pricing. Also available is a small TRUMAN bust. Harry Truman's ability to get along with all factions in his party made him a contender for the Democratic vice presidential nomination in 1944. Roosevelt, running for a fourth term, was eager to find a lieutenant who would help him avoid the difficulties that Woodrow Wilson had encountered in the Senate after World War I.
Truman, [1884-1972], 33rd president of the United States, 1945-1953, sworn into office at the death of President Franklin D. Roosevelt, as World War II was reaching its climax. He authorized the dropping of the atomic bomb at Hiroshima, thus ending the war with Japan. Working to enforce a lasting peace, he helped plan a world organization of nations, UN, 1945-1953, and initiated the cold war foreign policy of containing communism. Elected to the presidency in his own right in 1948, Truman had his greatest impact in foreign policy, and his commitment to containing the postwar spread of Communist influence in the world set a pattern in American diplomacy that prevailed for many more decades. Among his most notable achievements was the defeat of Communist takeovers in Greece and Turkey and of the Soviet Union's attempt to push the West out of Berlin. Robert Toth was commisioned to create a life size bronze bust of Harry S. Truman for the Masonic Lodge of Columbia, MO. Similar works by Robert Toth can be viewed on the MASTERS WEB page.